Southern Illinois University Carbondale computer science senior Ayush Kohli, seated, and Amiangshu Bosu, assistant professor of computer science, work in a computer lab. Kohli recently won third place at the Association of Computer Machinery’s Student Research Competition world final, a prestigious, international event, featuring the work of 17 regional ACM student research competition champions. Kohli’s research resulted in DecisionDroid, a supervised learning-based system that identifies pirated Android apps. 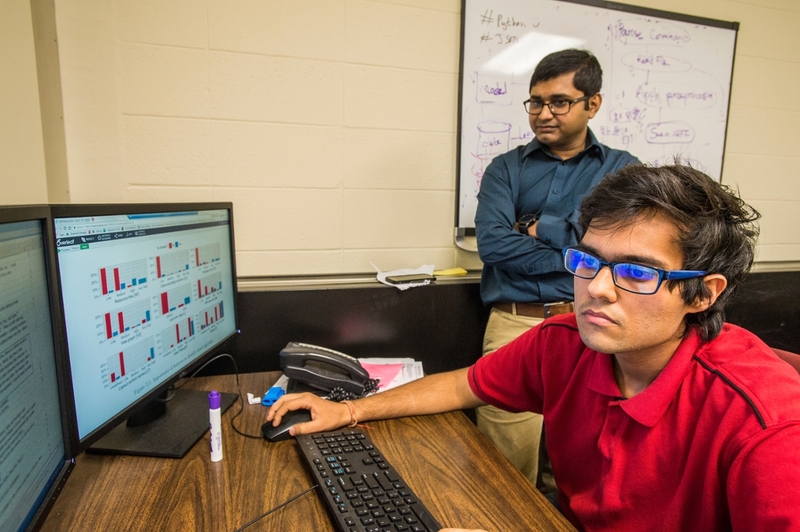 CARBONDALE, Ill. – You might say Southern Illinois University Carbondale student Ayush Kohli hunts modern day pirates, and his field of battle is cyberspace. In that arena, more than 85 percent of smartphone users have selected an Android operating system. The system gives them access to a multitude of applications – almost 3 million different apps, as of June 2017 – from the Google Play store alone. The platform also gives users the ability to customize their Android systems and install apps from unofficial, third-party marketplaces. But such a system provides opportunities for pirates to play havoc by modifying popular apps from the unofficial marketplaces or by injecting malicious code into apps they upload to such marketplaces, or even the Google Play store. The practice violates intellectual property laws, but also hurts consumers. And just like the pirates of old, this modern-day variety is a slippery lot, having mastered the ability to alter certain features of applications allowing them to evade detection. It’s a global scourge of the digital age, but Kohli, a senior earning a degree in computer science, has come up with what might be one of best counter measures available: DecisionDroid, a supervised learning-based system that identifies pirated Android apps. His work recently garnered him a third-place award from the Association of Computer Machinery’s Student Research Competition world final, a prestigious, international event. The competition featured the work of 17 ACM student research competition champions from different areas of computer science, who came from other top universities, including the Massachusetts Institute of Technology, Harvard, Northwestern, Cambridge and the University of Southern California, among others. Kohli secured his place in this competition by winning the first place in the 2017 Student Research Competition in the Software Engineering area. “It’s considered the top student research competition in our field, said Amiangshu Bosu, assistant professor of computer science, who mentored Kohli. During the competition, judges assessed each student’s knowledge, the caliber of contributions to the research and the overall quality of their oral and visual presentations. Students were required to present research posters and Microsoft PowerPoint presentations, with finalists submitting a 4,000-word paper describing their work. A different set of judges then evaluated each finalist’s complete body of work to select the overall winners. Kohli trained artificial intelligence in DecisionDroid using by having it compare a manually verified and diverse dataset from more than 18,500 app pairs. DecisionDroid then works by combining a set of 13 different similarity scores between the two apps. Testing showed it can accurately identify a pirated app 98.6 percent of the time. The achievement will send Kohli and Bosu to ACM’s award banquet this month in San Francisco, where Kohli will receive the award.